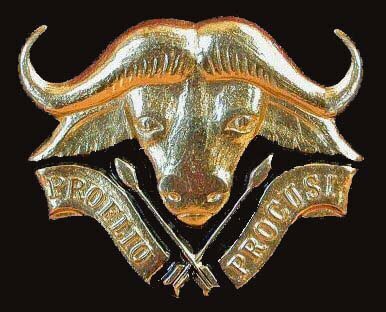 During the Border War South Africa fought from 1966 to 1989 against SWAPO, FAPLA, and Russia's surrogate Cuban troops, there never was an operation that had more chance of going wrong than operation Reindeer, the attack on SWAPO's operational headquarters for Southern Angola , but the rewards would be great, the people of South West Africa would be able to have free and fair elections without SWAPO terrorists intimidating and torturing them. The indigenous people were caught between a rock and a hard place, when Swapo arrived , so called "Sell-outs" would be made examples of, babies would be killed and their mothers forced to eat their flesh, if a headman was neutral , Sam Nujomas' henchmen would quickly sway popular opinion by publicly executing him as an example to those who did not toe the party line, if this failed a number of victims would be picked at random , and the local population , known as "PB's" (Plaaslike Bevolking) would be coerced into killing these, whilst singing the praises of PLAN (the military wing of SWAPO) , if this did not have the desired effect a kraal would be torched as an example to those who did not agree with Nujoma's idea of democracy. 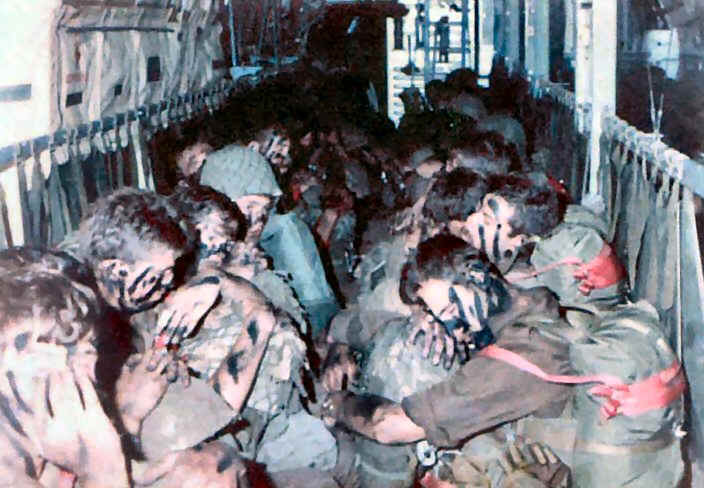 South African troops often came upon the corpses of these unfortunates, and could only wish that those in the outside world who always accused South Africa of being the villain of the peace could be present when they had to transport one of SWAPO's victims bodies back to those who would be grieving for them. 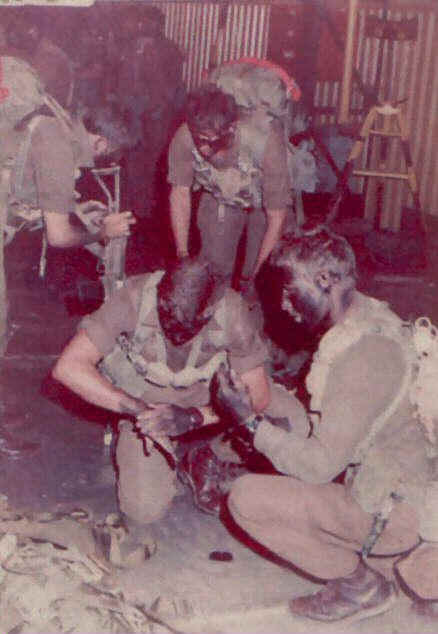 The Genesis of Operation Reindeer was Operation " Bruilof" ( Wedding ), initially scheduled for April 1978, this envisaged South African Forces attacking six SWAPO bases in and around Chetequera, but then fate intervened, and "Bruilof" was expanded to encompass an obscure mining town called Cassinga , Chetequera, and a heli-borne assault on a variety of SWAPO camps in the vicinity of these. As a result of intelligence reports the town of Cassinga had become a very interesting target for South Africa, during the border war South Africa had built up an extensive Sigint capability in countries such as Malawi, Rhodesia, and the Comores Islands, and these sources as well as Humint gained by South African Reconnaissance Commandos had catapulted Cassinga into the spotlight, the sleepy mining village on a tributary of the Cubango was a target worth hitting hard, despite the risks involved, this quiet backwater had become a complex training 700 to 1200 terrorists, the whole town was surrounded by an extensive trench system, with bunkers mutually supporting each other , and anti-aircraft guns that would be deployed against the South Africans in a ground role , something they were not aware of at the planning stage , this was going to a hard nut to crack indeed. 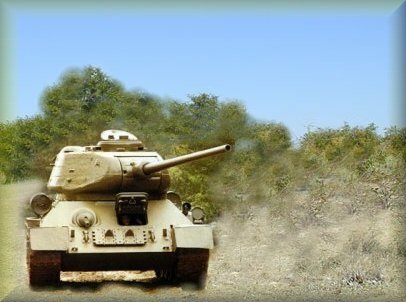 During this operation the South African Forces involved in the ground attacks would also try out new tactics and battle-test new equipment , the Ratel (Badger) Infantry Fighting Vehicle , armed with a 20 mm cannon (later on this would be up-gunned to 90mm , and take on Soviet T55 tanks , and come off best) The Buffel (Buffalo) mine protected vehicle, based on a Unimog chassis These vehicles would become a major export successes , with countries like Morocco, Saudi Arabia, Sri Lanka buying these. The ground troops' personal weapons would not be the Israeli Galil, that fired a 5.56mm round , the airborne element of Operation Reindeer would still be armed with the South African version of the Belgian FN rifle the R1 , later on all forces in the South African Defence force would be armed with the Galil, but these would be produced under license in South Africa , and would be known as the R4, Most of the Parabats who dropped at Cassinga would come to appreciate the superior stopping power of the 7.62 x 51 R1 round, a number of terrorists who were holed up in buildings at Cassinga were neutralised by the simple expedient of firing through walls, a feat that the R4 was incapable of. Whilst the planning for Bruilof was taking place, a problem that kept cropping up, was the fact that Cassinga was 250 Kilometers from the South West African border, any conventional assault would give the Terrorists ample warning, the one of those involved , Lieutenant-General Constand Viljoen proposed that an attack on Cassinga by Paratroopers had to be the solution , as SWAPO would not expect the South Africans to be so bold, and the element of surprise would be make up for the lack of heavy weapons the ParaBats would suffer from. The heaviest weapons the Parabats would have would be 60mm Mortars sans base plates the Patmor was still to come, to neutralize any armoured threat the Parabats would rely on RPG-7V rocket launchers , there was a certain irony in this, as the RPG7-V was the weapon of choice for SWAPO .Should the attackers find themselves under attack from Cuban and FAPLA forces the best that they could hope for was that the South African Air Force would be able to neutralize these forces and evacuate them by helicopter , but due to the Arms embargo against South Africa these were in short supply , especially the larger Super Frelons . The bulk of the rotary wing transport aircraft the SAAF had consisted of Puma helicopters that could only carry 10 troops to overcome this an HAA (Helicopter Admin Area) would have to be established inside Angola itself where the SAAF choppers would have to wait until the attack was over and done with, this itself was fraught with danger, should this be compromised the South Africans at Cassinga would be cut off with no means of escape. What Lt Gen Constand Viljoen was about to do had only been done once before , he was planning a to emulate a daring airborne raid on a stronghold deep in enemy territory, with no ground support, the previous one had been accomplished in May 1940..... when the Fallschirmjåger captured Fort Eben- Emael. The total force to be deployed was at least 1/3 below battalion strength, and most of the force consisted of Citizen Force Reservists , their peacetime occupations ranged from Diesel Mechanic to Accountant, Business Executive to Shunter, but the one thing that made all of these occupations meaningless was the Burgundy beret they all wore, the mark of the ParaBats . Breytenbach's intelligence officer , Captain L Welman unveiled a detailed sand model of the target in the barn where the briefing was held , in addition to this reconnaissance photos that had been obtained by the SAAF had been hung on the walls. 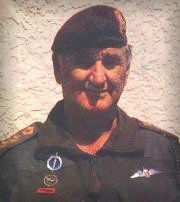 As usual Breytenbach did not mince his words, and impressed on his men that they had to hit the ground running, if you want to kill a paratrooper the quickest and easiest way is to hit him as soon as he lands, if you allow him to consolidate his position you've lost your chance. The Bats started getting ready about about 01H00 on the morning of 4 May 1978, rifles were checked again, grenades were inspected to make sure that the spoons and pins were securely seated and taped into place, ( the safety pins had been straightened for easy extraction) magazines were filled and each man made sure that the second last round was a tracer, RPG gunners checked their missiles and made sure the safety pins were secure , the mortar crews made sure the increment charges were dry. Breakfast consisted of brown bread and coffee, not many had a meal , a quick gulp of coffee, the rasp of a match, the flare of it igniting, the flame cupped in two hands highlighting the matchbox with the Lion Match Company logo, a drawn and haggard face dipping towards it, with a Lucky Strike, Texan, Gunston, Venus, Lexington, Rothmans, Van Rhyn, or Benson and Hedges pursed between its lips, the sharp inhalation, and the angles and planes of each mans face in bas relief as he lit up. 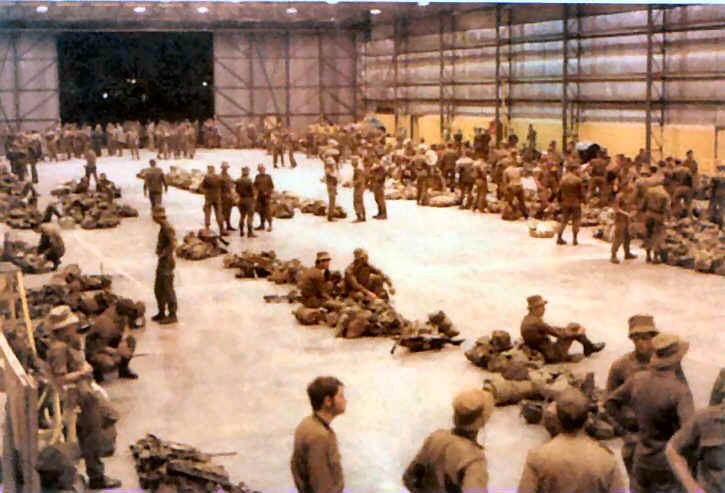 Each man checked and rechecked his buddies gear and by 04H15 the Bats started towards their respective transports, once everybody was in place, the hatches hissed shut, the starters whined, the propellers revolving slowly at first, and then the four Allison AE 21 00D3 on the C-130's and the two Rolls Royce Tyne 22 Turboprops on the C-161's roared into life, filling the air with sound. 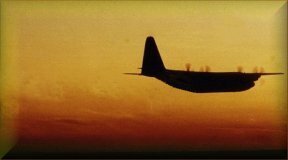 The planes lumbered down the runway picking up speed, and suddenly they were in their element , winging eastwards on the first leg toward s their target. 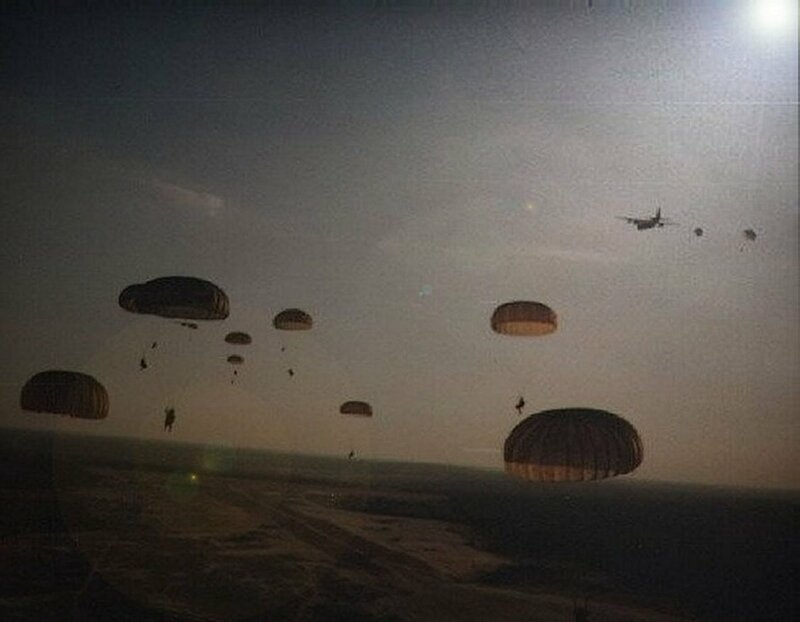 One of the occupants was reminded of the song of the first soldiers who went into battle as paratroopers in 1940, the "Fallschirmjäger :- Rot Scheint die Sonne ...."as he glimpsed the rising sun through a window in the Hercules. He had decided to become a paratrooper when he was 14 after reading " Die Valskerm Battaljon " a novel about the German Para troopers at Monte Cassino, now he wasn't sure that had been such a good idea. 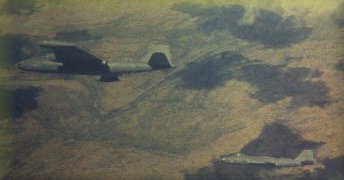 As soon as light allowed the Taskforce dropped to the deck to avoid Angolan radar, this tactic also served another purpose, should they overfly an enemy force, they would be long gone before someone could fire at them.At 05H19 the 4 Canberra Bombers took off from Waterkloof Air Force base in Pretoria, when they reached Rundu in South West Africa, they made a dog leg northwest and headed towards Cassinga , 20 minutes later 4 Buccaneers of 24 Squadron followed, the 5th was delayed by a mechanical problem but followed soon thereafter. 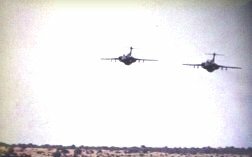 At the time the eight transports were lifting off another Buccaneer armed with 72 68mm SNEB rockets had departed from Waterkloof to Grootfontein where it would remain on standb y for close support if required. Two Puma helicopters departed from Omauni at the same time to set up the HAA about 22 klicks east of Cassinga . The pilot flying the first was Commandant James Klerk who would be in charge of the Rotary Wing element of the operation. To maintain the element of surprise it had been decided not to do a ground reconnaissance, this in itself carried the risk that there might be a Unita presence who might mistake the choppers for Angolan ones, or worse a FAPLA one, which would compromise the operation. To cap it all one of the passengers in the first chopper was Lieutenant-General Constand Viljoen. It would be a massive propaganda coup for South Africa's enemies if he was to be killed or worse still captured. Viljoen was no shrinking violet, like his predecessors in the Anglo Boer War he believed in leading from the front. This habit of his almost got him killed during operation Reindeer when he got blown out of the hatch of a Ratel when this hit a TM46 anti tank mine. As the choppers reached the HAA Viljoen was the first one out and to everyone's relief there was nobody around. Radio beacons were put out should the strike aircraft need any navigational aid and the all clear was signaled to Ondangwa . In the meantime, back at Omauni, ten Pumas and five Super Frelons carrying a protected element of forty two men plus a medical team and extra fuel were getting ready to leave at 07H00. The South Africans had perfected this tactic of setting up a HAA far behind enemy lines during the Rhodesian War, where they assisted Ian Smiths government in cross border strikes against Zanla and Zipra. 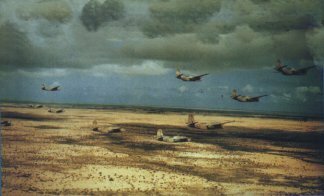 In the meantime the Task Force carrying the Paratroopers went in to a holding pattern over the higher reaches of the Cubango river waiting for the Canberra's to start their bombing runs on Cassinga. The Canberra's were keeping well to the east and made sure that they were overshooting the target as not to alert the ground defenses, once they had reached a point 20 nautical miles north east of Cassinga they turned back on themselves and at 08H00 they crossed the town from north to south at 350 meters and commenced their bombing run. The target disappeared in a welter of smoke and flame and for those on the ground it seemed that hell itself had engulfed them. The Golf bombs functioned exactly as they were designed to do, bouncing up in to the air and then exploding sending needle sharp pieces of shrapnel slicing through flesh and bone, it was now time for SWAPO and their followers to experience the horrors at first hand, which they had visited so many times on defenseless civilians in South West Africa. Trucks burst in to flame, buildings collapsed and a plume of dust and smoke rose in to the early morning sky. As soon as the Canberra's had finished their bombing run the Buccaneers came barreling in at 150 meters and dropped their 450Kg HE Bombs in to the raging inferno below. Three of them were tasked to hit the town and one was assigned the veterans camp. 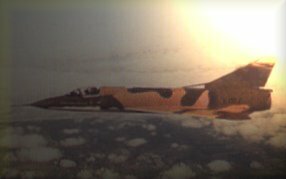 This plane completely missed its target but the two Mirage III's hosed the whole camp with 30mm cannon fire. The leader of the Buccaneer force made a circuit and reported that a considerable amount of damage had been done to the target especially towards the east of the Techamutete road. A major part of the base was burning fiercely and through the smoke he saw that a lot of the infrastructure had been damaged. 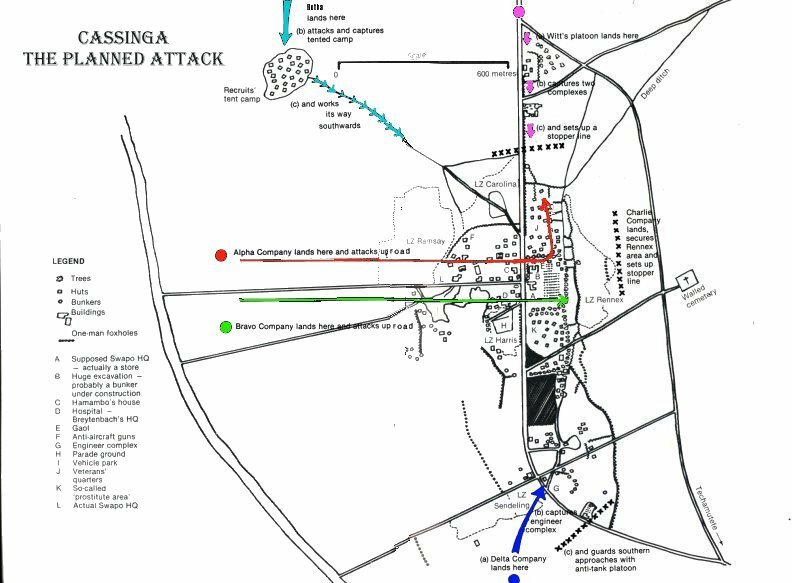 On the ground scores of terrorists were lying dead or wounded, the camp reminded him of a ants nest that had been disturbed with people running to and fro, the wounded and maimed writhing in agony in the vicinity of the area immediately east of the road and around the parade ground. Fortune had smiled on the South Africans this day as their attack coincided with a parade on the parade ground. It has since been speculated that this was a routine roll call and according to SWAPO itself most of the 4098 terrorists had gathered there that morning just before the attack had taken place. Despite SWAPO's protestations that Cassinga was a so called " refugee camp", most of the dead, both men and women, were wearing olive green Cuban uniforms, very few bodies were dressed in civilian clothes. So much for their "refugee status" claim.